As the title suggests, many people are learning lessons or giving lessons in this eight episode of the first season of The Wire. But why those lessons can be given or taken is often more interesting, and the real heart of this episode is about bonds, both familial and fraternal, and how those shape our ideas of the world. The opening functions as both a comic piece and a frightening warning for McNulty. While at a market wit his kids, he sees Stringer Bell, and has his kids follow him. The boys are masterwork detectives already, getting the license plate number of Bell’s car. But McNulty loses his boys in the process, and I’m sure this is not the last time he will realize he has put his children in danger. It’s a really dumb line, but it’s meant to be dumb, and show how the patriarchal structure of the police works. Everyone has a place in the pecking order, and sons always try to take power from their fathers, and shall never get it. And loyalty between brothers is what keeps anything going. This episode really digs in the ambivalent friendship between McNulty and his partner Moreland. 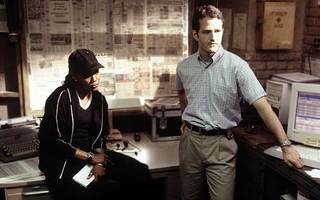 When the wire tap reveals Omar as the shooter in a murder, McNulty asks Moreland to keep the case profile low to the detective on it, with the promise he will deliver the shooter down the line, though both know that is a lie. As a point of karma, Moreland asks McNulty to cover for him after he pursues a young girl, but ends up drunk and passed out with burnt clothes at McNulty’s place. Another key sequence happens when Gregg comes to Freamon with a worry that the murder arrest from last episode may be wrong as well, but Freamon, as a close uncle, knows her too well, and teaches her how to trust her judgment. The street works by family as well, though often it is literal family. A comedic opener has Wallace’s younger brother asking for help on math. The kid can’t figure it out, but when he puts it in terms of drug business, he can easily figure it out, citing that getting that wrong will get you killed. Wallace however, is not playing by the rules of the family, and D’Angelo is worried about how he hasn’t come in for over a week. But he’s got other issues to worry about, such as a party where a girl ends up dead. D’Angelo later talks in metaphors to his girlfriend, who suggests doing something else with his life. However, family is family, as The Godfather taught us, and D’Angelo is not a son but he’s certainly the Michael of the family—he is both the best and worst for the job, and must eventually take it over. The other important relationship in this episode is between Stringer and Avon. Avon is in charge, but Stringer is still the head of operations. In a surprising sequence, McNulty tails Stringer to a community college where he takes a class in macroeconomics, and then later yells at the boys in one of their front store by using the lesson he learned. 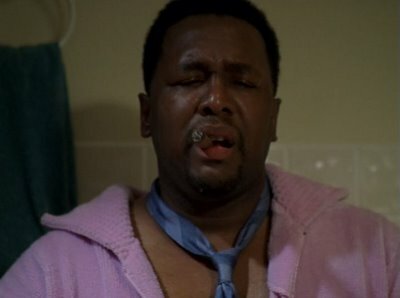 When Omar’s name comes up as the shooter of a couple of Avon’s gang, Avon puts $10,000 on his head. But Stringer thinks it’s a bad move that will only lead to more killing, and a truce followed by a surprise attack would be better. Avon doesn’t put this suggestion into use, but he certainly considers it. How Avon and Stringer became close is still shrouded in mystery, along with both their pasts. But they are a mirror to McNulty and Moreland, ready to do anything to each other, and always willing to consider each other’s advice, though they may not take it. As this first season starts heading toward a close, it’s important to remember how this world is defined by power and relationships, and how easily those can build or crumble. And certainly many will crumble.